can remedy this with a cool and fun Inflatable Thanksgiving Turkey. This old Tom is 6 feet tall and is sure to let everyone in the neighborhood know that Thanksgiving is really happening at your house. He is humorous good fun for the holiday. This balloon inflates in seconds and comes complete with lights, an internal fan, ground stakes, and tethers. Just be careful -- this may lead to further Thanksgiving decorating! 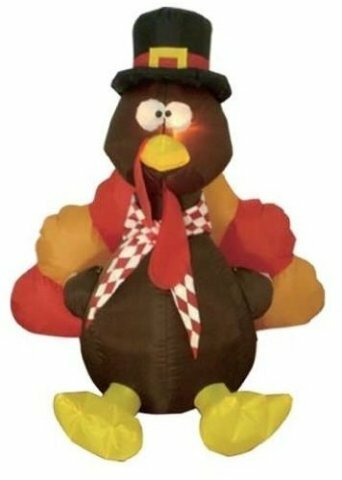 To order an Inflatable Thanksgiving Turkey to decorate your home, click here. Kiwi! The "Happy But Sad" Animal Video of the Day!! !